Whether you are traveling across the country or across town traveling with your pet finches isn't as difficult as many people believe. Most people worry about the stress their finches will endure while traveling. The truth is your finches will likely feel less stress over the move then you will. In fact, some actually seem to enjoy the trip. For those that do not want to look out the window as you are driving down the road, you can simply cover the change and they will remain calm and relaxed throughout the trip. Having a small cage specifically for travel is very important. If your travel cage is too large the birds may get knocked around inside the cage as they attempt to move from perch to perch. After all they are used to the cage not being in motion while they are moving about. In your vehicle the cage will get bumped and jarred slightly as you travel causing them to overshoot or undershoot perch. If this happens too frequently they may panic and can thrash themselves against the cage bars. The smaller the cages is, the less speed they can pick up while moving from one area of the cage to another and therefore are less likely to injure themselves. You will also need to make sure your finches have access to food and water during the trip unless the trip will take less than an hour or two. Keep water and food bowls shallow or you will likely end up with bird seed and wet spots all around the cage. Sometimes tube fount waters and feeders work well while traveling as they are less likely to spill. Spray millet can be used in place of the normal seed diet for trips taking less than one day. When placing your cage in your car please be sure to secure it so it does not slide around your car during transit. The cage sliding from side to side each time you turn will certainly spook your finches and results in spilled food and water. You can use your seat belt to secure the cage by wrapping it around the cage or rig up your own strap apparatus if you like. You do not want your finch cage directly in front of a blowing vent in your car, whether you are running the AC, the heater or simply the fan. Large amount of air blowing directly at your finches is not good for them; whether they are in a car or in a house. It can lead to respiratory infections and unnecessary stress. For this reason it is also best to keep all of your windows rolled up while traveling. It is also best to keep your finches out of direct sunlight and away from the windows. Some finches do seem to enjoy looking out the window as they travel this is fine as long as they can retreat to a shaded part of the cage to escape the heat of the sun as it is coming through that window. If your finches do not enjoy looking out the window, this does sometimes freak birds out, then simply cover the cage with a white sheet or small towel to block their view. 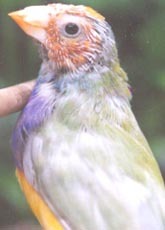 Most finches will remain very calm and still while in a darkened cage. If the trip will require more than a day of travel you will need to keep in mind that the conditions inside your vehicle at all times whether you are in the vehicle or not. For example if you stop for gas and the car is in a sunny location the interior of the car will heat up very quickly as you are filling your gas tank. It can quickly become deadly to your finches trapped inside. The same can occur if you stop to eat at small restaurant. 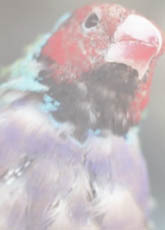 Or during the winter months your finches could easily freeze while you are inside a hot meal. For this reason I recommend you stay in your car as much as possible with your finches, if you are uncomfortable with the temperature your finches probably are too. If you must stop for an overnight stay and the weather outside is too hot or cold for your finches to remain in the vehicle try finding a hotel that will allow you to bring the finches into your room. Simply out of courtesy to use a large bath towel to cover the floor before putting your birds cage there. This way when you leave in the morning you can simply pick up the towel and shake off all the excess seed outside without creating a large mess in the hotel room. It may also be wise to drape a small towel over the back of your finches cage so they do not potty on the wall; as you know many finches can poop in any direction. With a little common sense and not driving like a total maniac you can easily travel with your finches.